Save the best for last, they say (here, it's more like "the best of the best"). In this final installment of the three-part "all the cases" Nock Co. review, I'll be taking a look at my two personal favorites: the Hightower and the Brasstown. From what I can tell, there really is nothing else like the Hightower out there on the market. It's a bifold case that holds "three" pens on the left (see my photos below and you'll see why I put "three" in quotation marks"), and "one" notebook on the right (same caveat). Needless to say, this is an incredibly versatile pen case. The construction is similar to the Sassafras and the Maryapple in materials, design, and quality, meaning that all are excellent. I chose the Kickstarter limited-edition color scheme with Peacock Blue Exterior and Midnight Interior. Sorry folks! From what I hear this one's not coming back! The Brasstown is the "big boy" of the Nock Co. crew: a six-pen wrap that folds into a larger Chimneytop-style case and still leaves room to store a handful of loose pens, pencils, erasers, etc. on the sides. 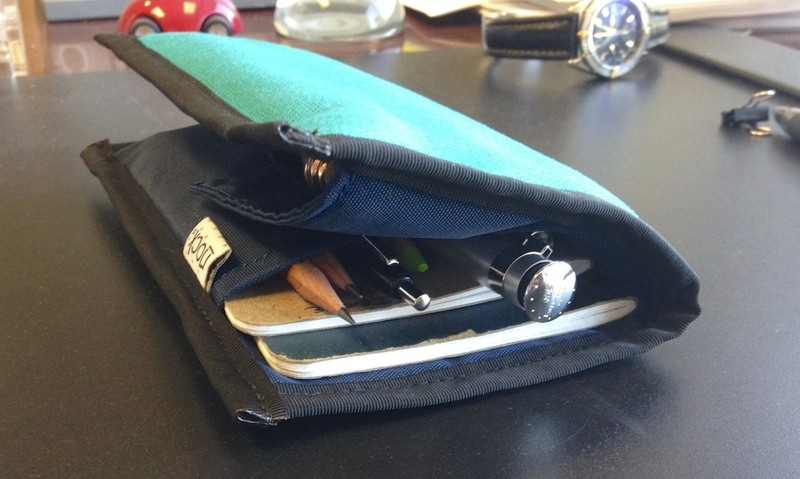 The interior pen roll uses enough fabric to ensure that your pens don't touch one another, and the clip from one pen won't scratch the body of its neighbor. As others have remarked, I have zero concern about storing high-dollar pens in this case. I will add, per my earlier suggestions in Part I of this series, that the Brasstown is definitely long enough to store woodcase pencils on the side. My only concerns would be lead breakage and graphite dust, both of which would be solved by capping your pencils. I've not tried this yet. For the Brasstown, I chose the Orange/Mango color scheme, which looks awesome, though sometimes at work I wish that I'd chosen something a bit more subdued. Of these two, I think the Hightower works best for me as a daily carry case to and from work. 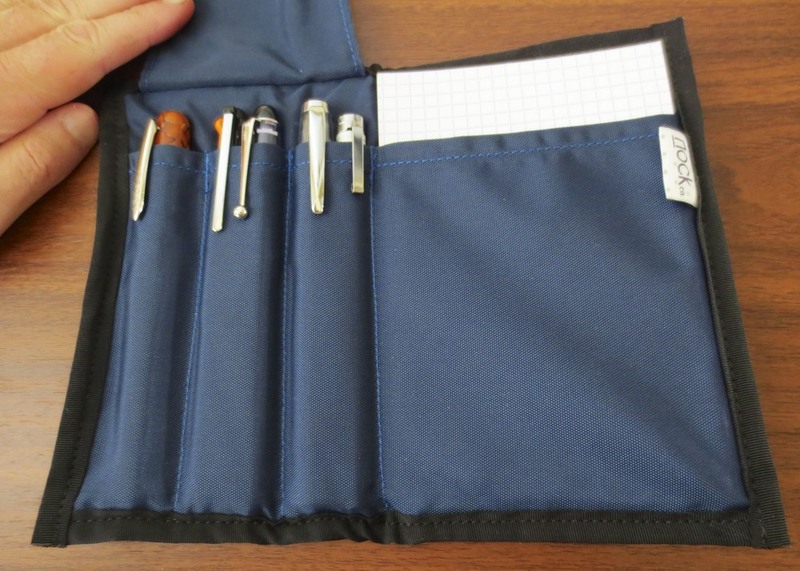 The Brasstown, however, is always full, given that it holds a wide variety of pens, as shown, and the extra storage inside the case makes it extremely handy. I took this case to the Atlanta Pen Show last month, simply because of the capacity. In terms of overall conclusions, it's hard to believe that Nock Co. is just a startup. While I had relatively high expectations from this Kickstarter, the fact that I received seven cases of this quality for $75 blew me away. These are polished products that reflect a high level of sophistication in terms of both manufacturing tolerances and an understanding of their customer base. I have not seen any pen storage options on the market right now that will give you equally well-built cases at this price point. From my understanding, it was Brad and Jeffrey's goal to fill this niche, and they've more than accomplished that. So what would I personally like to see from Nock Co. in the future? A dedicated pencil option, certainly, which I understand may be on the way. Given the durability of the nylon used to construct these cases, it would also be great to have a folio option that fits Rhodia pads, or a notebook cover that would fit those A4/A5/B5 notebooks with the flimsy paper or cardboard covers that simply don't hold up to being carted around in a bag. Something tells me we won't have to wait long to see more great stuff on the way. . . .